Colorado State University is a leading institution for water research in the world. The Colorado Water Institute (CWI), exists for the express purpose of focusing the water expertise of higher education on the evolving water concerns and problems being faced by Colorado citizens. Not only does Colorado State focus on the latest water research, but attempts to implement best management practices for land and water use. One important set of examples of Colorado State's commitment to water quality are our bioremediation projects, which includes a constructed wetland for waste water from our research greenhouses. When our central greenhouse complex was renovated, concrete flooring was one of the significant upgrades. Prior to this point, there was no attempt to capture waste water from excess irrigation. With concrete floors we faced the dilemma of what to do with excess irrigation water. The closest sanitary sewage access point was inadequate and we could not connect with the storm water system for obvious concerns of pesticides and fertilizers. Thus a constructed wetlands project was envisioned. 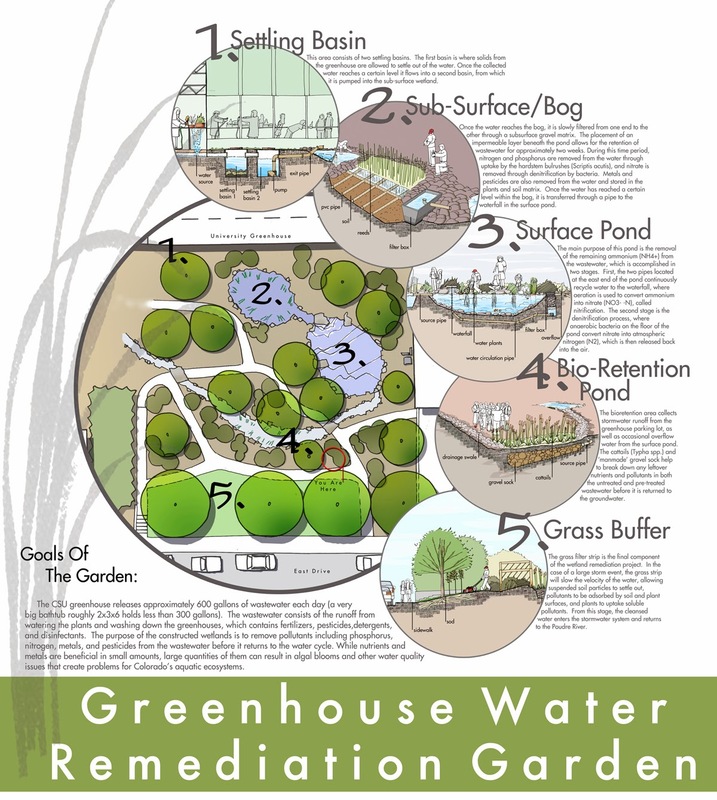 The greenhouse manager and the campus landscape architect for Colorado State Facilities Management partnered with a class from the Landscape Architecture program to design a bioremediation wetland. Creatively use waste water from the Greenhouse. Keep waste water from leaving the site. Clean-up (remediate) the waste water. Demonstrate bioremediation and creative uses of water and water-conserving plant materials. Provide a service learning opportunity for students. Create a space for students and staff to learn from and enjoy the outdoors in a naturalistic setting. Don't adversely impact the operations of the Greenhouses.